Food To Go may not need labelling at all if you prepare fresh food and can advise your customer at the time of sale about the freshness and contents. Its different if food is prepackaged and sold from a shelf the customer must be able to inspect the labelling to check freshness by the expiry date and also ingredients, price, allergen warnings and nutrition detail for example. You might just want to print price labels with a simple description in which case one of our small thermal transfer printers will do that job. Your Logo can be preprinted on your labels so your brand is always visible. For years we have supplied sandwich, cake and bakery labels preprinted in colours and customers added product details using their own computer and one of our small thermal transfer printers. We bought the first Full Colour label roll labels printers to the food industry as far back as the year 2000 bringing new possibilities for printing labels at the work place. Now we have more that 5000 installed full colour printers where we supply the customer low cost blank labels and they print as many labels they need each day. Delays are avoided since you don't have to wait for pre-printed labels to be made, simply print what you need when you need. Wastage is eliminated since you only need low cost blank labels on rolls that cost very little and besides your stock of blank labels can be used to print labels for any of your products. You reduce the amount of storage that was needed to keep the pre-printed types. You change the label details anytime using your computer so there are no old stock labels to go out of date when products change. Own Brand promotion is possible, add your own logo or add your customers logos so they can sell the same product under their brands achieving wider markets. Low cost full colour labels you can print is now possible by using colour ink printers with large bulk ink tanks. For example one of our customers who had as many as 6 thermal printers and a warehouse full of part printed labels before, now uses two of our bulk ink tank printers to print all the labels needed each day in full colour gaining operational flexibility whilst eliminating most of the label waste and saving money on every label printed! Allergen information has become an important part of modern food labelling. 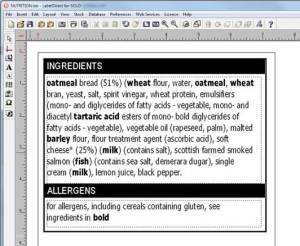 It's important to highlight any allergen in your food product by making it stand out, a easy way is to type the allergen in Bold and using our easy to use BarTender label layout and printing software. Quantity declaration (QUID) is the % figure you see in ingredients listings like if if you were selling a Tuna fish sandwich then you must show the % of Tuna in the sandwich ingredients listing for example Tuna (21%). Nutrition 'traffic lights' have become commonplace on food and drink labels and are normally shown as a row of coloured boxes that change colour to indicate a high, medium or low concentration of say fat, sugars and salt that we all like to keep track of in our diet, some for medical purposes. The FOOD MANAGEMENT SYSTEM (FMS) is a complete software program that includes a recipe method of combining ingredients to create all your Food To Go product specifications and automatically prints the important details onto your product labels like Allergens, QUID % and NUTRITION as well as EXPIRY DATE, PRICE, STORAGE INSTRUCTIONS, and BARCODE when needed, even add a readable QR CODE to direct smart phone users to your web site. 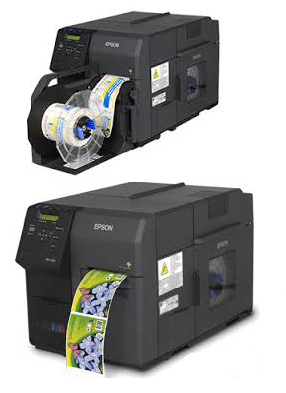 Watch the video of the EPSON C7500g printing food labels fast. Watch a video showing how the FMS food recipe labelling system works with colour.